Scotland are showing the attitude that will drive them to improve more after winning their first Six Nations match in two years, says coach Vern Cotter. Tries from John Barclay, John Hardie and Tommy Seymour, with Greig Laidlaw kicking 21 points, brought a welcome 36-20 win over Italy in Rome. Scotland next play France at home before an away trip to Ireland. "If we keep the desire to improve, that attitude will move us forward," said Cotter after his first Six Nations win. "We wanted to improve and I think we can improve from this game. We can become better again. "This will give us a bit more confidence to keep working and being a bit more accurate and re-enforcing the things we have done well. "It was an important win. We will enjoy this evening and then next week turn our heads towards the French game. "We are certainly getting something from our hard work and stubbornness and desire to get better. For some of these guys it was a first Six Nations win so it will do them some good." 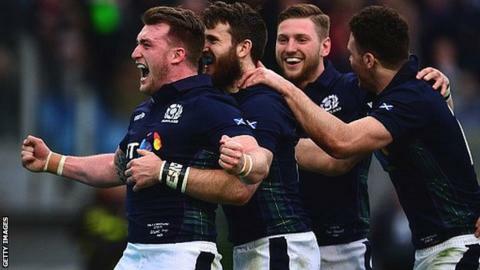 Five of the starting team - Finn Russell, Mark Bennett, Jonny Gray, Willem Nel and John Hardie - as well as replacements Stuart McInally, Tim Swinson, Josh Strauss and Peter Horne - enjoyed their first Six Nations victory, plus Cotter himself - at the eighth attempt. "Credit to the players - I thought they put in a good effort," Cotter added. "They were numbers down on a couple of occasions and they battled hard to fight out the win and score a try at the end. "It was by no means an easy game. We got into an early lead but they came back as we expected. I am happy for the players. They prepared well and got the win so it's good." Captain Greig Laidlaw, who was named man-of-the-match after landing eight kicks from nine shots at goal, was relieved to be finally celebrating a Six Nations victory. "There is no happier Scot than me," he told BBC Scotland. "It's been a long time coming, hasn't it? "I really felt we deserved to win - we were the better team. We scored 36 points, but as much as our attacking play was good, we were camped on our line a couple of times and kept Italy at bay, so I am delighted with the character of the side. "There are always going to be times in a game when you are under a bit of pressure, and the most pleasing thing was we were calm and in control in defence. "Credit to the boys in the scrum. The platform they gave us was second-to-none. "For us as a collective, it is brilliant. It gives us confidence in the way we play. We didn't scrape home, we finished the game in style. "We can't wait to get back to Murrayfield now and play at home." Flanker Barclay, who scored the first try, paid tribute to Laidlaw's leadership in the wake of opening defeats by England and Wales. "Greig was great," he added. "He kept the boys together and kept us upbeat. It is a good bunch of boys - the best I have been involved with. "There has been a lot of false dawns over this team so we need to keep working hard and keep improving."